"I cannot rave enough about Michelle and her awesome work! From the moment I sat down with her to discuss what I wanted in my arrangements, she captured my vision and added the flare I was looking for into my beautiful flowers. More than anything, I wanted King Protea as the main piece in the bouquets and told Michelle she could add whatever else she thought would look nice to complement the protea. She knocked not just the bridal party bouquets out of the park, but also the groomsmen/groom's boutonnieres, the arbor piece, and centerpiece arrangements with the unique additions I was hoping for. I would 100% recommend this florist. Excellent service, great pricing, and overall a wonderful experience. Thank you for adding such beauty to our wedding day!" "Michelle was amazing! We didn't need a lot of flowers, just bouquets for myself and the girls, boutonnieres for the guys, a couple corsages and some greenery. Michelle was able to work within our budget, gave me the exact flowers I had been dreaming about (but couldn't quite put into words) and I couldn't have been happier! Highly recommend Michelle and Lips Tulips for any of your floral needs!" "Michelle's floral designs exceeded my expectations and made my wedding vision come to life! From our initial meeting to delivery, Michelle maintained excellent communication and truly listened to what I wanted. When I first saw my bouquet it took my breath away! She also designed the most wonderful bough of flowers that we were able to use in the ceremony space and then later on our sweetheart table. I wish I had more occasions for flowers in my life, because I would work with Lips "Tu"lips flowers again in a heartbeat!" "Michelle Hess and Laurie Hess are amazing! They made my vision come to life. Highly recommended!" "Michelle was wonderful to work with. She was personable and always easy to get in touch with. Her work was stunning and affordable!" “Michelle is an INCREDIBLE florist and the sweetest person!! We were able to meet with her to talk about our vision for the wedding, and since I had seen pictures of her beautiful work I was pretty content to give her a general idea/feel for the flowers (colors, things I definitely did and definitely didn't like), and let her go. I truly think that giving an artist the artistic liberty to do what they think is best results in the best end result, and Michelle proved that right! 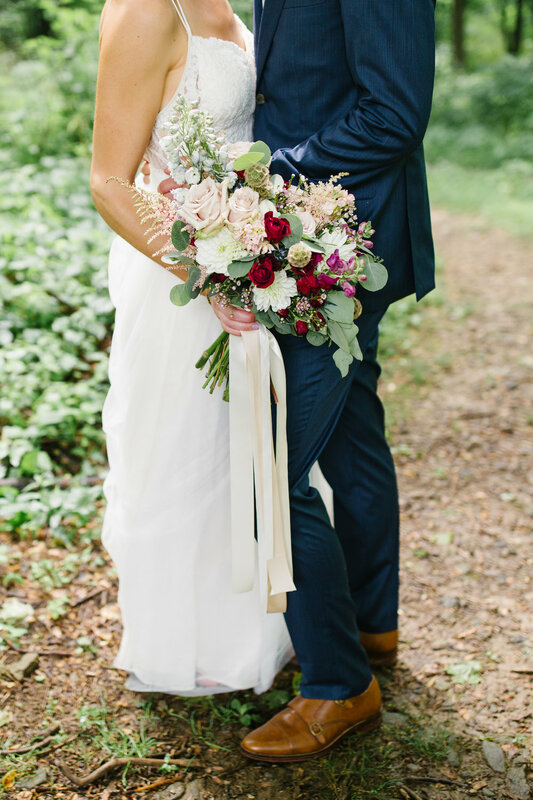 She captured the look we wanted perfectly (romantic, lots of greenery, kind of loose and dreamy), and we got SO many compliments on our flowers! When I first saw my bridal bouquet I couldn't even believe it - it was BEYOND beautiful and so much more incredible than I could have dreamed! She also created a floral hair comb for me that was stunning and had such a huge part in creating my bridal look. Michelle gave great advice when we were making decisions on what to include with our venue/general décor/within our budget. She worked so wonderfully within the limits we had, and we appreciated it so much. "Michelle and Laurie were very easy to work with! They met with us in the beginning so I could communicate my vision and budget. From there they developed a very detailed plan that I could envision before sending in the deposit. When the lavender I had originally wanted was not going to be available on the day of my wedding, they quickly came up with an alternative. My wedding flowers were beautiful and stayed so all day! I would recommend Lips "Tu"lips to any engaged couple!" "Michelle was so great to work with! I loved chatting with Michelle about my vision for the day. She was very willing to work with my budget and was really excited to hear about what I wanted and what she could do to make my dreams come true. Flowers were very important to me on my wedding day and I loved how they turned out! I haven't seen anything like it, I'm so excited for how unique they were and how they captured my vision so well. I was so glad we hired Michelle and Lips "Tu"lips to do our wedding flowers and I would recommend her to any other bride. Thanks so much for the beauty you added to our day!!" "Michelle came recommended from a close friend and I cannot rave about her work enough! I second guessed a lot and she was there to help talk me through my choices and really see my vision. She was more than accommodating, calm, professional, and caring - she left me the most thoughtful card by my flowers which really was so sweet. From our first meeting, and countless emails, I never felt like "just another customer" to Michelle - I felt like she really took the time to get to know me and understand what I wanted. She was a rockstar." Follow me on instagram for more Flower-y goodness!